Ready for a baking fiesta? Use a circular cookie cutter to make a hole in the centre of 3 of the sponges. Secure the first sponge (of the ones with the hole) to the cake board with a dab of plain buttercream, then spread a thin layer of plain buttercream over its surface. Place the other 2 sponges (the ones with the hole) on top of each other adding a thin layer of buttercream in between them. Fill the hole in the centre of the sponges with a bunch of colourful Cake Angels sprinkles. Place the final sponge (the one with no hole) on top with some buttercream. Divide the buttercream into 5 bowls and add a different colour to each. 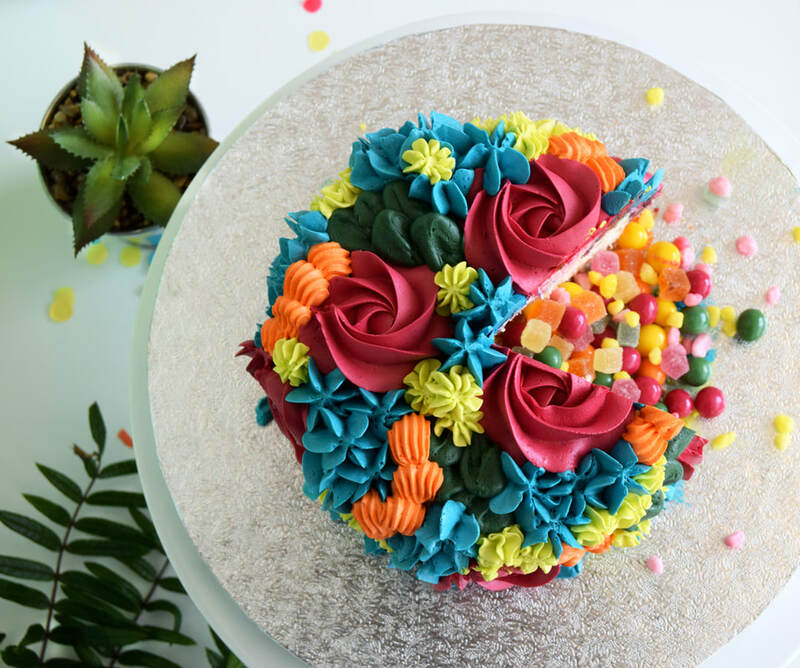 Fill piping bags with the different coloured buttercreams into piping bags and using your favourite nozzles, swirl the different colours across the top and sides of the cake until it is fully covered and no gaps remain. Experiment with the different shapes that your nozzles can create. Mix up the sizes and shapes to give an interesting finish.